This Giving Manger set includes everything you need to bring the spirit of service into your home. This tradition will become a family favorite year after year, and it will surely help create some of your most cherished Advent and Christmas memories! Click here to view a short product video. A book – A heartwarming story to explain the tradition and get your kids excited to start. 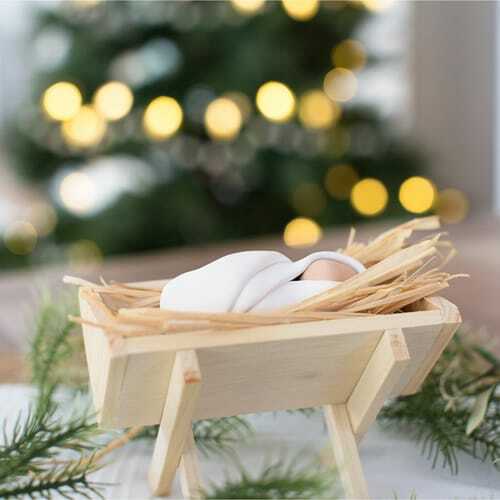 A wooden manger – to be placed in a very visible spot in your home, waiting to be filled. A bundle of straw- A piece of straw will be placed in the manger after each act of service. A baby Jesus- To be lovingly placed in the manger, full of service and love, on Christmas Day. My Dad gave our family the most amazing gift today. I read the book at dinner tonight and we talked about the Spirit of Christmas and more importantly the act of giving. I believe in giving more than you take and this really brings it home. The kids were so excited about all of the ways to be kind and do things for others. Next thing I knew, my son was clearing the table and washing the dishes without being asked. This is a new tradition for the Reidy family. It manger & doll are of sturdy quality & the book is well written. The children were excited to do kindnesses and then add a piece of straw to the manger. I think this is too pricey, together with shipping. I did get a discount and I really wanted it. I am glad I purchased it. Beautiful gift for young families to start a tradition with young ones to put the focus on the real meaning of Christmas. Highly recommend this. This has become the perfect Advent Activity for my family. The story was beautiful and set the tone for the season. And it has been absolutely amazing to see the straw fill the manger. The manger is easy to construct and rather sturdy to use. My children are 8 and 13 and it is allowing them to be more thoughtful about their choices. Baby Jesus is nice and heavy, so when he goes into the manager all the straw pulls down. Perfect Advent/Christmas gift for families. Fantastic product. Great way to help our children prepare for Christ's birth during the Advent season. A great visual affirmation of the value of our good deeds which is often important for many of us, especially our young ones!